I recently returned from an amazing trip to Cairo, with a 36-hour stopover in Istanbul on the way home. While there, I learned something wonderful about the meaning of my name that continues to make me smile. While I am not a strict Nominative Determinist, I do take Plato’s Cratylus dialogue more seriously than most. I love learning new names, and often ask people what their names mean. Perhaps this fascination stems from the fact that my ambivalent parents gave me 5 (!) names, not including my surname, and my godfather gave me one more after I injured my back. I have spent a great deal of time contemplating names and attempting to integrate mine into a coherent identity. Growing up I was always the only ‘Jonah’ I knew. In the 90’s the name gained popularity, but I still reflexively turn everytime I hear it (I can only imagine that Johns and Michaels learn to tune these out). The Old Testament’s Book of Jonah is a fabulous story. I’ve studied it closely and continue to find gems of wisdom and mystical insights. I have always appreciated that Jonah was: 1) One of the few (only?) prophets in the Old Testament sent to help the gentiles. 2) One of the only prophets in the Old Testament that anyone ever listened to! In the closing coda, a mysterious “gourd” casts a shadow over Jonah’s mind (what kind of plant was this magical qiyqayown? ), leading him to a transcendental experience in the desert where he learned to appreciate the universal nature of humanity. Great stuff – succinct, but it packs a punch. For a while I have known that Jonah the prophet was called Yunus (يونس) in the Qur’an. Jonah’s story in the Qur’an is quite similar to the Old Testament, though much shorter (in the Qur’an Jonah is close friends with Jinns ;-)). In Hebrew Jonah (יוֹנָה) means ‘dove’. Noah sent out 3 Jonahs to see if the flood waters had receded. But, to the best of my knowledge, Yunus does not mean anything special in Arabic. In Istanbul I learned that in Turkish, Yunus means dolphin. What a trip. 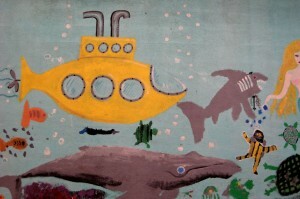 In the past, in order to read the story of Jonah literally, I used to have to postulate UFOs or Yellow Submarines. I wasn’t quite as skeptical as this critic, but the story never added up on the plane of mundane reality. What if Jonah was saved by a dolphin(s)? Instead of being swallowed by a ‘Big Fish’, he could have been engulfed by a pod of dolphins. Sailors being saved by dolphins was a common motif in the ancient world. For example, Telemachus, son of Ulysses, was saved by dolphins, and to this day, we continue to confirm reports of humans saved by dolphins. Doves and Dolphins. What a name. Using the Gentle Calm theme designed by Phu Ly. WordPress took 0.692 seconds to generate this XHTML page.